“Fisto’s Forest” was my first storyboard assignment for the second season of He-Man and the Masters of the Universe. I am not going to retell the story here. If you aren’t familiar with this episode you might want to watch it before reading further. I debated writing about this episode because of its shortcomings. Then I thought it might be instructive on how so many talented people could get it so wrong (myself included). I don’t have a copy of the original script so I can’t comment too much on the quality of the writing. After spending time on the writing staff at Filmation I learned how stories can suffer from too much editing (or not enough). I do know that the script was too long and major chunks had to be cut out. The cover of the storyboard at left shows that the dialogue (normal pause footage) and the action (slugs) were over the target running time by 394 feet or 4 minutes, 23 seconds. This was very aggravating for me as a storyboard artist because days of work could have been avoided if the cuts had been made before the script was finalized. To document my irritation I drew graphic scene deletion notes instead of the typical “scene cut” scribble. As I was digging through my Filmation files for this installment, I made a discovery. I had saved my original storyboard pages of some of the deleted scenes. I guess I didn’t want to reboard them if they were put back in a later edit. Of all the boards I did at Filmation, this is the only one that I have some original art. And it’s not one of my favorites. 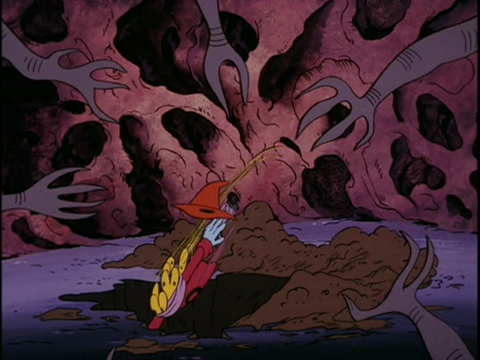 The sequence at right (Scenes 57-64) is an Orko gag that was easily dropped for time. Most of the other scene cuts were extended chases. Some of the dialogue was cut in the revisions but without the script I don’t know if any exposition was dropped. This show was a hard luck case all the way through production though I didn’t know how many problems there were until months later when the show was assembled and edited into a rough cut. Lou Scheimer was livid. He called everyone involved with this show into the screening room and made us watch what he had just seen in the edit suite. There were errors everywhere. Scenes didn’t hook up. 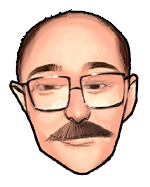 Characters were painted inconsistently. 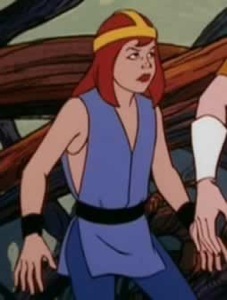 He-Man walked into a scene, a close-up of Prince Adam spoke, then He-Man exited. Actually, that one was my fault. I drew the close-up stock of He-Man in the panel but wrote Adam’s stock number instead. I apologized to Lou after the screening but he said there was no excuse for no one else catching the mistake. That’s why we had a Checking Dept. Normally, a typical episode would have about 20 percent retakes. Fisto’s Forest had 75 percent! Some animators added a shirt line under her arms on the side. In some scenes it was there. In other scenes it wasn’t. 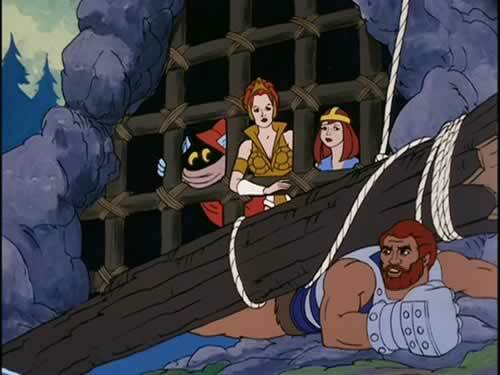 In the scene above when Teela and Rayna were stuck in spider goo, the line disappeared in the middle of the animation. I think some of the retakes were cels where the undershirt was painted another color. Fisto’s Forest title doodle from my storyboard. Even the fact that he is aligned with Skeletor doesn’t get much play. Skeletor does a cameo via a glowing sphere, says a few lines and then nothing more from him either. There isn’t any reason given for Skeletor imprisoning the region’s elf lord in a magic sphere and putting Fisto in charge of making the locals miserable. This, by the way, is in the back story of the back story and is mentioned in Rayna’s plea to King Randor for help. The elf lord is another barely used element. No real explanation for why he was captured, just a device for returning the evil forest to niceness at the end. Rayna was recycled from Podi in MU-66037 “It’s Not My Fault.” The color changes were an improvement. This particular sequence had other continuity problems besides Rayna’s undershirt line. Sadly, not all of them were fixed the way I thought they should be in the retakes. 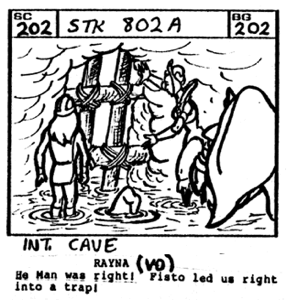 Scene 107 is a downshot showing Rayna and Teela stuck in a large pool of spider goo. 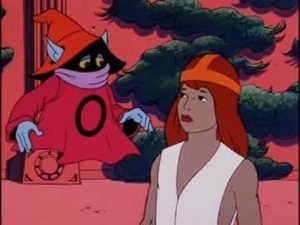 Orko is not stuck because he floats, so he continues a bit then turns around. The final rendering of the goo pool was much smaller than I called for in the board panel. The script called for a large pool so that Teela couldn’t reach anything to help her get out. He-Man was their only hope for escape. In Scene 108 I drew the pool extending beyond the edges of the screen. In the rough cut of the episode the goo pool matched my storyboard drawing. but when cut together with Scene 107 the size differences were jarring. I wanted the downshot goo pool to be enlarged. Instead the pool in Scene 108 was shrunk to match the tiny pool in Sc-107. So in the final cut, it did solve the problem but the continuity mismatch should have been caught before cels were painted and shot. The scene at right was not a continuity problem or retake. I just don’t like the awkward posing of Fisto in the final scene. I’m not claiming that my storyboard drawing was anything great. It’s just that I tried for a casual pose with his feet on two different trees. The final drawing has Fisto somewhat squatting on the one tree instead of balanced between the two trees. He is also supposed to be looking down at Rayna’s father Yarrow (lower screen right) instead of at the camera. Not to be completely negative about this episode, I did like the background renderings on Fisto’s part of the forest. The script described the area around Fisto’s HQ as “grotesque and evil, perverted by the influence of the magic sphere.” All these backgrounds were labelled with an ‘x’ next to the numbers to indicate the sky was not normal day colors. I called for the sky to be painted the same as our stock storm clouds which I liked better than the night bg colors. 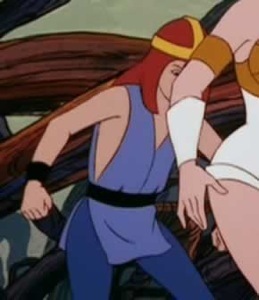 Here is a little bonus shot of Orko without his hat when Teela drags him into the hole BattleCat dug to escape Fisto’s trap. Unfortunately, he is moving so fast we don’t get a good look at him. After our heroes escape from Fisto’s tree trap, he springs another one by poking a hole in the dam he made. I made use of three of the stock water effects but still needed one more angle to show Teela, Rayna, Battle-Cat and Orko pushed off screen by a wall of water. So I called for some new water animation to be added to the stock system. The animated gif just shows the key frames. Watch the episode for full animation. The water washes them into a cave trap. Scene 202 shows the cage gate. I thought I had made the openings between the logs small enough to prevent escape but the layout artist added more logs to make it tighter. That’s fine with me. It works. They can’t get out but they can still see through the openings to banter with Fisto in the next scenes. Continuity problems dealing with scale happened in Scene 206 (right), a close-up of Teela pushing on the cage gate. In this shot the gate is drawn massively huge and the openings are large enough for all but Battle-Cat to squeeze through. This mistake was not corrected in retakes . This makes the jeopardy unbelievable and the later scene of Rayna getting stuck in one of the openings ridiculous. The gate changes size again in Scene 213 (below). Yes we can see Teela, Rayna and Orko just fine but they are quite capable of fitting through these openings except for Orko who is huge compared to Teela. When Fisto is trapped by a fallen log, Rayna squeezes out through the gate. She helps Fisto by handing him the rope so he can hoist the log off his back. The animation isn’t convincing that this takes much effort. Fisto is so impressed with the kind act he reforms and becomes a good guy. This change plays very flat and superficial. Overall, this show was plagued with trouble. Still, there are a few scenes of good animation of He-Man fighting the giant spider. In the Mike Young 2002 production of He-Man, Fisto was given a different back story: the estranged brother of Man-At-Arms. Though I’m not settled on that relationship, the storyline was well thought out and more believable than Fisto’s Forest.